The 2002 paperback edition of The Ghostway, published by HarperTorch, a division of HarperCollins Publishers. The cover art is by Peter Thorpe. This edition's front cover displays the author's name in large raised type in metallic silver above Thorpe's focal point, a black eagle figure. Behind the figure is a photograph of a river bordered by yellow-leafed cottonwood trees illuminated in slanting sunlight. At the bottom of the cover, the book title is printed in raised metallic silver. The front cover photo wraps onto the bottom of the back cover, fading to black toward the top, where the novel synopsis is printed in white. The back cover also contains praise, publisher imprints, novel price, and bar code. The inside front cover contains advertising for other Hillerman novels. 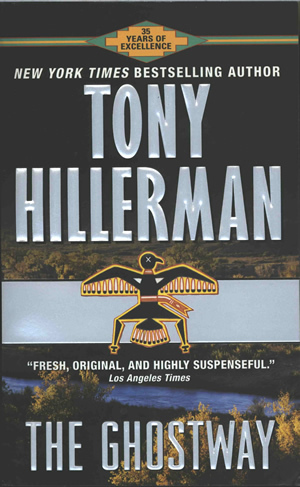 The inside back cover displays the 1993 AP NewsFeatures photograph of Tony Hillerman above his biography. Binding: Full-color paper covers. Title and author's name are printed in grey on the spine.